A sea of students dressed in red rushed into Pilgrim Academy’s newly renovated building on Monday to begin the first day of the 2018-2019 school year. Pilgrim’s $8 million construction project, which is a part of the voter-approved 2012 Bond Program, features an expansion and building renovation that incorporates architectural aspects of both the past and future. Pilgrim Principal Diana Castillo said school staff worked for more than two weeks to make sure that everything was ready to go for the first day of school. This entry was posted in 2012 bond, 21st century schools, Business Operations, District VII - Anne Sung, First Day Openings, News and tagged 2012 bond, 2012bond, bond 2012, Pilgrim, Pilgrim Academy on August 29, 2018 by HISD Communications. Three new classrooms are being added to the current expansion of Pilgrim Academy as part of a plan allowing forecasted bond surplus funds to be used for outstanding needs at bond campuses across the district. The new plan, approved last month by the HISD Board of Education, set aside an additional $842,000 for Pilgrim. This entry was posted in 2012 bond, 21st century schools, District VII - Anne Sung, Elementary Schools, Middle Schools, New schools and tagged 2012 bond, BuildHISD, Pilgrim, Pilgrim Academy on June 15, 2017 by HISD Communications. 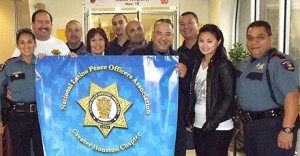 Thanksgiving came a little earlier than usual for a dozen needy HISD students this year, but they were still delighted to receive free turkey dinners with all the trimmings from local members of the National Latino Peace Officers Association (NLPOA). This entry was posted in District III - Sergio Lira, District V - Sue Deigaard, District VII - Anne Sung, District VIII - Diana Dávila and tagged Bellaire, CECHS, Energy, Hartman, Pilgrim, police on December 2, 2014 by HISD Communications.